The wall saw is the most versatile methods to efficiently aid the removal and alteration of concrete. Wall sawing employs the use of surface mounted track system to provide the most precise placement of the saw cut. The ability to mount to any surface whether it is a vertical wall, floor, steep incline or overhead, the wall saw equipment creates endless opportunities for creative solutions to removal and alteration challenges. Utilizing wet cut diamond blades, ranging from 24" to 66" diameters, the wall saw system is capable of cutting dust free through 30" of concrete from a single side. 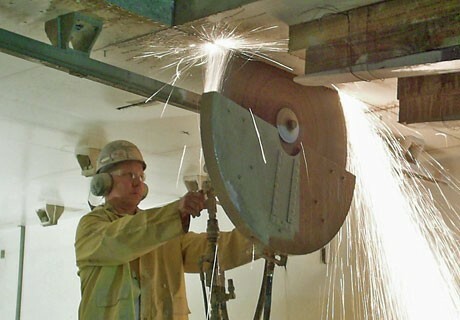 If accessible from both sides, saw cuts can be matched to provide up to 60" thick dust free saw cut. Self contained full service trucks with on board diesel hydraulic units provide the capabilities to utilize the wall saw at most locations. External electric and diesel power units are available for locations where the truck mounted units are unable to service. With the use of our many options emission free status can be achieved at any location. Wall sawing is the ideal solution for concrete and masonry openings, complete concrete removal, and otherwise hard to reach areas where vibration and access of other larger equipment is a factor. Saw cut surfaces are smooth and in most cases acceptable as a finished product.